Awaken your Soul, Strengthen your body, Rejuvenate your mind! 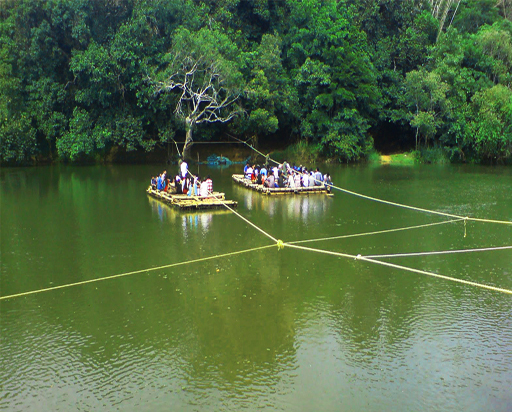 Kuruva Island popularly known as Kuruvadweep is a group of small islands in Kabani River. These islands form 950 acres of dense forest. Located at 17 km from Mananthavady, 35 km from Kalpetta, Kuruva Island is one of the beautiful eco-tourism spots in Wayanad. Being an uninhabited evergreen forest, Kuruva Island is a home for rare specious of birds, flora and fauna, herbs and orchids. This is actually a paradise for migrated birds and the commonly seen birds include parrots, hornbills and a variety of butterfly species. The small islands are accessible by rafts made of bamboo. Rowing of these bamboo rafts are done by ropes and you will get a different experience with the same. The ropes are tied to the trees on other side and one has to pull it to reach the other side.The dense forest itself is worth for nature lovers. The boating facilities here are managed by District Tourism Department. Some islands are accessible by walking through submerged rocks. Since these rocks might be slippery please take utmost care while doing this. Permission to enter into this island is done by Kerala Forest Department. Sometimes the entry is restricted because of heavy rain or the presence of elephants and some other animals on the island. A pass should be obtained from the Department of Forest. Bamboo Rafting Charge: Rs.300 for 6 persons for 30 mins ride.